I’m delighted that Mr. Turquoise Synth for piano and 1-bit synthesiser has been selected as one of 26 pieces to feature at the MISE-EN MUSIC FESTIVAL 2018 in New York. I loved going to the festival back in 2014 and am interested to hear how Mr Turquoise (designed by Blake Troise aka PROTODOME) gets on duetting with someone else than the dedicatee Yshani Perinpanayagam. More details to follow! This entry was posted in Composition, Electronics, Gigs and tagged blake troise, ensemble mise-en, Mr Turquoise Synth, Yshani Perinpanayagam on March 20, 2018 by Ben. Yshani Perinpanayagam will play my 'Mr Turquoise Synth' (2017) alongside pieces by Blake Troise and Cheryl Frances-Hoad at her performance and talk at the new National Video Arcade Festival, ALL YOUR BASS. This entry was posted in Gigs and tagged Yshani Perinpanayagam on January 19, 2018 by Ben. Yshani Perinpanayagam will play my Mr. Turquoise Synth (2017) in Nottingham on 19 January alongside pieces by Blake Troise and Cheryl Frances-Hoad at her performance and talk at a new festival, ALL YOUR BASS, set up by the National Videogame Arcade. This entry was posted in Composition, Electronics, News and tagged ALL YOUR BASS, blake troise, Mr Turquoise Synth, National Videogame Arcade, NVA, Yshani Perinpanayagam on November 30, 2017 by Ben. This entry was posted in Composition, Recordings and tagged blake troise, mr. t, protodome, Turner Sims, Yshani Perinpanayagam on May 16, 2017 by Ben. 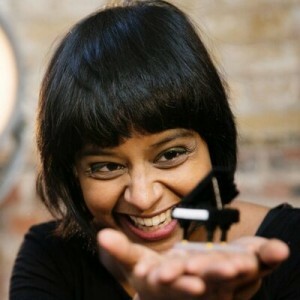 On Monday 8 May at Turner Sims the fantastic Yshani Perinpanayagam will play my newest piece, Mr. Turquoise Synth, as part of her Piano Play: Power Up programme. The concert, which is part of the University of Southampton Music Department Professional lunchtime concert series, also features works by Cheryl Frances-Hoad and Southampton PhD composer Blake Troise (aka PROTODOME). Each of the pieces engages in some way with the sounds and tech of retro-gaming. This entry was posted in Composition, Gigs and tagged blake troise, Mr Turquoise Synth, Turner Sims, Yshani Perinpanayagam on May 5, 2017 by Ben. Yshani Perinpanayagam performs 'Mr Turquoise Synth' for solo piano and 1-bit synthesizer (made in collaboration with Blake Troise) for Fresh Klang as part of Kammer Klang! 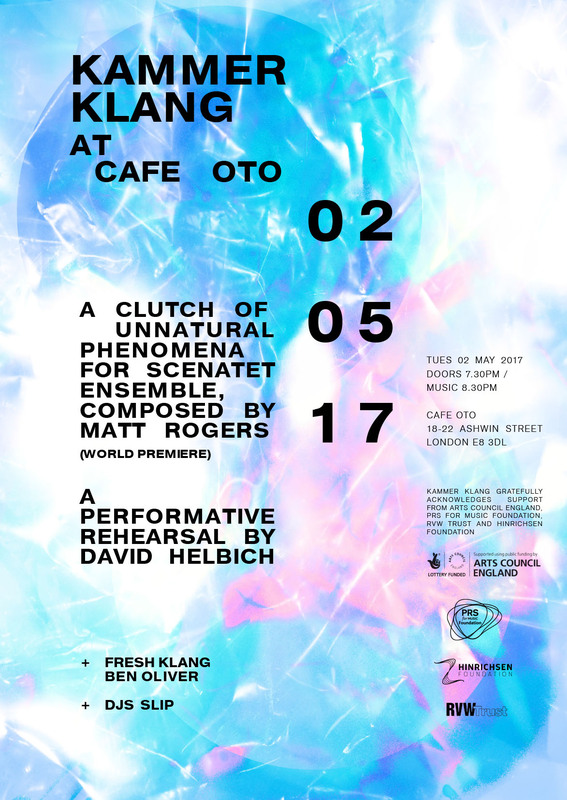 This entry was posted in Gigs and tagged Kammer Klang, Mr Turquoise Synth, Yshani Perinpanayagam on May 2, 2017 by Ben. The fantastic Yshani Perinpanayagam (piano) will play my newest piece, Mr. Turquoise Synth (featuring a 1-bit synth designed and made by Blake Troise aka PROTODOME), at the mighty Kammer Klang next Tuesday (2nd May). 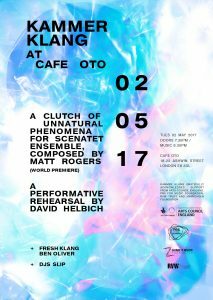 Great lineup at Cafe Oto in Dalston. Music at 8.30pm and tickets available here. This entry was posted in Composition, Gigs and tagged blake troise, Kammer Klang, Mr Turquoise Synth, Yshani Perinpanayagam on April 28, 2017 by Ben. As part of the National Theatre's River Festival Rambert Dance Company's Pianist, Yshani Perinpanayagam, explores game and play at the piano. Featuring my own '147', a selection of Játékok by György Kurtág and 'Game On' for piano and Commodore 64 by Cheryl Frances-Hoad. This entry was posted in Gigs and tagged 147, Yshani Perinpanayagam on August 20, 2016 by Ben. The fantastic Yshani Perinpanayagam will perform my work for solo piano and video, ‘147’, for a second time as part of the Rambert Dance Company’s offering to the at the National Theatre’s River Festival in August. Her performance of Piano Play features my piece, a selection of Játékok by György Kurtág and ‘Game On’ for piano and Commodore 64 by Cheryl Frances-Hoad. This entry was posted in Composition, Gigs, News and tagged National Theatre, Rambert Dance Company, Ronnie O'Sullivan, Yshani Perinpanayagam on July 13, 2016 by Ben.